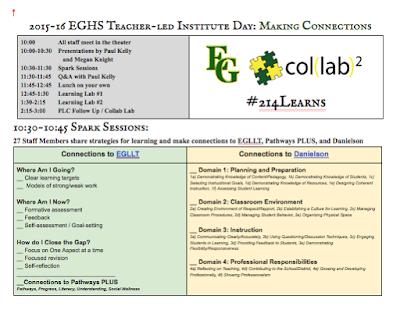 The Collab Blog: Teacher-led Institute Days at EG! Today we carried on our tradition of our teacher-led professional learning with our January Institute Day: "Making Connections." We collaborated with our colleagues across all departments to plan Spark sessions and Learning Labs that made connections to our professional learning goals and the learning goals we have for our students. Check out this Google Doc to see more details on the schedule and to see how we crowd-sourced resources, inviting staff to add their own examples and resource to the Google Docs for each Spark Session. Check out this Storify to get an idea of what the day "looked like." Future posts this week will share more details and resources from the Spark Sessions and Learning Labs. 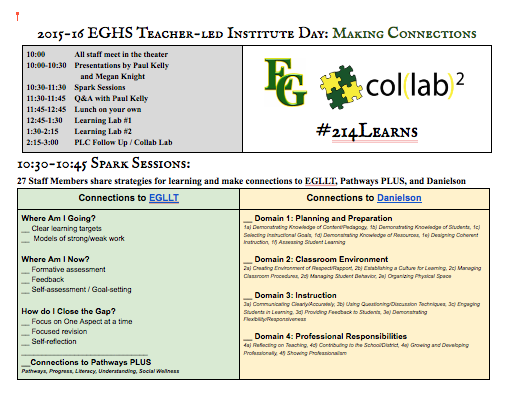 If you are interested in learning more about our tradition of teacher-led institute days, check out the drop-down menu on this Teacher-led Institute Day link on our Collab Lab Resource Hub.